This episode begins with Anakin Skywalker's and Ki-Adi-Mundi's troops getting ready to move on a Geonosian factory. (Actually, it begins with the narrator setting the scene in which we find "our intrepid heroes." That line, by the way, was funny and reminded me of vintage serialized war shows.) Ahsoka is trying to explain the battle plan to their troops, but Anakin keeps interrupting to add details, which annoys his Padawan. This frustration is obvious to the clones, who grin at each other as they receive their orders. I like that the clones are very much aware of the tension between Ahsoka and Anakin. Their knowing smiles convey a lot, and it reminds me that they do see and hear a lot more than their commanders realize; they're not just dumb droids. 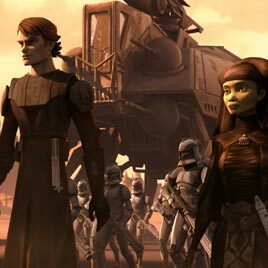 As Anakin and Ahsoka are arguing after the briefing, a new pair of Jedi arrives to assist them: Luminara Unduli and Barriss Offee. As the newcomers approach Anakin and his Padawan, Luminara warns her apprentice about the unusual nature of their battle comrades. When they meet, Barriss bows to Ahsoka, who finds this unusual, but gratefully offers her hand to the other. Before we go any further, I need to say how glad I am that we're seeing other, non-essential Jedi such as Barriss Offee. It shows that The Clone Wars is not all about the "main gang" and that the creative team wants to explore more perspectives and character sub-plots. I also like that Barriss is a more "conventional" Jedi apprentice -- a fitting contrast to Ahsoka's rule-breaking, decidedly unconventional behavior. Luminara is dubious about Anakin's full-on assault, and suggests an alternative involving explosives in the main reactor of the factory. She says that her apprentice has memorized the layout of the factory's interior, and Ahsoka suggests that she accompany Barriss inside. Anakin objects, but Ahsoka refuses to back down. With Anakin and Luminara using the clones to draw Geonosians out of the factory in defense, the two Padawans will sneak inside and blow up the reactor using detonators. It strikes me that Ahsoka only wanted to go along with Luminara's plan to prove a point about her self-sufficiency to Anakin. This is not necessarily a bad thing; it is another contributing factor to their strained and very realistic relationship. The more headstrong Ahsoka is, the more difficult we see Anakin's job to be. One thing I found extremely funny -- if a bit jarring -- was when the four Jedi essentially synchronized their watches. It contributed to the feeling of this being a real dual-pronged mission. In defense of the creative team, this action does make sense if you want to keep precise mission time. Meanwhile, inside the factory, Archduke Poggle the Lesser and his tactical droid -- more on him in a second -- discuss the current operating efficiency of the factory. We learn that they have a new secret weapon which will soon be operational, but that they are continuing to pump out troops ready for battle even as the Republic advances. Now, to the tactical droid. He wasn't a huge plot element, but I think this needs to be addressed, especially given my continuing commentary about The Clone Wars. There are certain small elements of repetitiveness -- such as seeing these tactical droids playing butler to every major Separatist leader -- that prove that The Clone Wars has developed a sense of stability and continuity. Meanwhile, just before the first act ends, Ahsoka and Barriss climb down into the catacombs of the Geonosian factory, and emerge into near-complete darkness. The second segment of this episode begins with a positively creepy shot: Ahsoka and Barriss moving swiftly through the factory catacombs and, despite Ahsoka's misgivings, eventually find the right way to the power plant control room. They are, however, seen by a Geonosian drone, who rushes to inform Poggle the Lesser of the intrusion. The environment in these scenes is great -- I like that they are continuing this creepiness angle instead of just putting the Jedi in vast outdoor battles. Back on the surface, where the Republic and Geonosian forces clash, the battle is getting more intense. A group of Geonosians flies out from each tower in the middle of the expansive battlefield, ambushing the clones, who are momentarily surprised. I don't understand how the clones didn't do a survey of the area before going in. Wouldn't they at least have used a scanner to detect the Geonosians hiding in those towers? Also, even without scanners, towers in the middle of the battlefield seem incredibly obvious. The Republic's AT-TEs cut through groups of droidekas, but soon Poggle the Lesser unleashes the new Separatist secret weapon on the assembled clones: twenty experimental super tanks. Anakin has Rex fire on the new vehicles, but the vehicles are ray-shielded and suffer no damage. The tanks fire back, obliterating Republic artillery emplacements. I'm glad we're seeing new vehicles being introduced (the Super Tanks are incredibly conducive to lots of explosions and flying bodies), but I just hope they stay in the TCW lexicon instead of being a one-trick pony. I do, however, have a problem with how the battle proceeds. If the Super Tanks are ray-shielded, why didn't the clones just fire a torpedo or something similar? Isn't that what Luke Skywalker did? And furthermore, if ray shields are so common (as they must be, given their usefulness against lasers), why don't Republic battalions take that into account by bringing physical projectile weapons? Inside the factory control room, Ahsoka and Barriss are planting their explosives. Their time, however, has run out -- all of a sudden, the main door slides up to reveal Poggle the Lesser and his tactical droid, along with a group of Geonosian warriors and a super tank. While the Geonosians dispose of the Jedi's explosives, Ahsoka and Barriss must deal with the Super Tank. The second act ends with the tank advancing on the two apprentices. When the show returns, the Republic army is doing very poorly. The Super Tanks are blasting through Republic troops and vehicles alike. Anakin tells their forces to fall back, and suggests that they draw the Separatists onto the bridge and collapse it. This suggestion was needed to convince Captain Rex, who starts angrily at the thought of retreat. I like that Rex displays a certain level of defiantness when Anakin tells him to fall back. It is clear that he doesn't like retreat any more than he likes victory. His defiance reminds me of Anakin's in a way. As the super tanks roll across the bridge, Anakin and Luminara use the Force to nimbly move around the bridge's underbelly and place thermal detonators to the structure. As the two Jedi reach the other side of the bridge, Anakin triggers up the detonators, destroying the bridge and sending the tanks falling into the canyon below. The felling of the Super Tanks reminded me a lot of the way Luke took down an AT-AT in TESB: "That armor's too strong for blasters," so they had to use some unconventional thinking. Anakin's feeling of success is tempered by a reminder from his chronometer: Ahsoka and Barriss's bombs should explode soon, but so far there's been no sign of the two apprentices. Speaking of the two, Barriss at this point has managed to climb inside the tank and take over the controls. Ahsoka climbs aboard, but the two soon realize that they are stuck: they can't complete their mission without their bombs. They could use the tank's weaponry to blow up the generator in the control room, but that would take them out in the resulting explosion. Barriss says that this is their only option if they are to do what they came to do. Ahsoka contacts Anakin to say that she won't be leaving the factory, and the two apprentices fire on the generator. I know they set up the resulting explosion sequence to be very dramatic and to imply that the Padawans died, but does anyone really believe that they did? It seemed like too much of a stretch. I wish I could say that the sequence tugged at my heartstrings and brought a tear to my eye, but ... nope. Outside the factory, the two Jedi Masters watch in horror as the structure collapses in a series of explosions. After the explosions end and the dust clears to reveal a blast crater, Anakin tries to contact Ahsoka via comlink. Luminara suggests that, if it was time for their Padawans to go, they should accept this. Anakin, however, doesn't resign himself to that fate. In Anakin's defiance we again see his refusal to let go of the ones for whom he cares. Luminara and Barriss espouse the strict "we need to focus on the mission" principle, but Ahsoka and Anakin don't accept their fate. They act on their instincts and refuse to give up -- the question is, was it the smartest thing to do? It worked now, but who's to say it will always work? "I am prepared to let my student go," Luminara says. "Can you say the same?" Anakin certainly could not, neither for Ahsoka nor for Padm?. We then cut back to the super tank, which (surprise!) survived the explosion relatively intact. Ahsoka and Barriss use their lightsabers to provide some light, and Ahsoka uses a power cell from the super tank to boost her comlink's signal. Outside, Anakin is determined to find his Padawan. He seems to be getting more and more exasperated, but all of a sudden he sees his comlink pulsing with a signal from Ahsoka. He sends clean-up crews to the source of the signal, but instead of waiting for that to play out (he's impatient and fearful, remember? ), he and Luminara use the Force to remove the debris covering the site of the signal pulse. Ahsoka and Barriss detect the digging above them, and soon they are able to emerge from the wreckage and rejoin their masters. This was a good episode, but I felt that it suffered from a distinct lack of plot at the expense of sending a message. The message was an important one: there are different types of Jedi, and often their ideologies will clash. The episode did a great job of addressing the question of traditional versus experimental Jedi practices. I'm glad to see this division of Jedi theology playing into the conflict. There were a few other issues, such as the ray-shielding conundrum, but overall the visuals and the underlying ideology message prevailed. I enjoyed it, but not as much as Landing at Point Rain.